Martin Starkey joins Licence Bureau as its first ever training and business development manager. Starkey has spent more than 20 years in the driver training industry at AA DriveTech and takes on responsibility for delivering classroom and in-car training for Licence Bureau’s fleet customers. His appointment comes as Licence Bureau passed the three million check milestone. 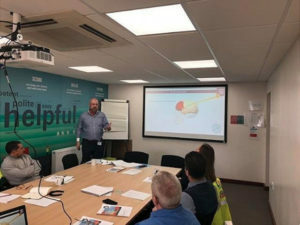 Two new workshops with additional multi choice modules have already been created by Starkey and trialled with Clancy Docwra, which are now being rolled out to customers. His appointment allows Licence Bureau to take the training in-house for the very first time as more companies look for external support for known risks such as distraction and fatigue, those with points on their licence, new employees or those who have been involved in an incident. Further changes at Licence Bureau include a promotion for Steve Pinchen to the board as sales director, after five and a half years as products and partnership development manager. Additionally, Jamie Thomson joins Pinchen on the company board as IT director, after four years with Licence Bureau and over 17 years in the IT industry. Licence Bureau recently won the Fleet World 2018 Honours for Innovation in Risk Management for work on its View My Data Portal.